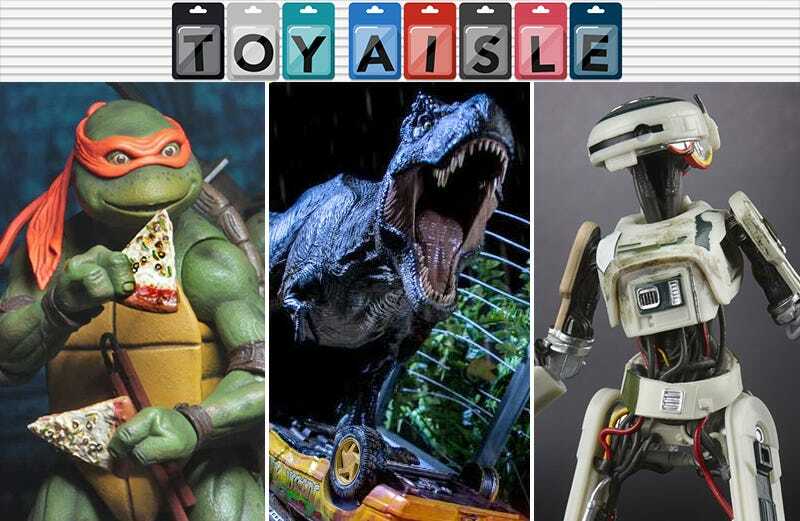 Welcome back to Toy Aisle, io9's regular round up of the coolest toys and merchandise we’ve seen floating around the internet lately. This week, the Solo deluge continues, SDCC’s 2018 exclusives begin tempting our wallets, and Lego just can’t stop revealing cutesy little BrickHeadz. Check it out! For years we’ve wondered if robots would be humanity’s eventual downfall, but we were wrong. Robots will rule the Earth one day, but only after humanity has become choked and buried under an endless roster of Lego’s collectible BrickHeadz figurines. The latest additions include Darth Vader and a Stormtrooper, as well as Anna, Elsa, and Olaf from Disney’s Frozen cash cow. There’s no official release dates for any of the new figures yet, but you can expect them soon, and probably with a $20 price point for a two-pack, and $10 for individual BrickHeadz. For Legend of Zelda fans, Link’s Hyrulian shield and the revered master sword are the most sought-after collectible items outside the game. But in Breath of the Wild, Link’s arsenal was greatly expanded, and gamers have come to embrace other items the hero relied on, like the Traveler’s Bow. This life-size, 40-inch long replica doesn’t actually fire (which is probably for the best as far as your co-workers are concerned), but for $80 it includes a glowing ancient arrow powered by batteries and LEDs instead of magical myths. Spielberg has a knack for creating memorable and iconic scenes in his films. E.T. and Elliott flying past the moon and Indiana Jones fleeing a giant boulder come to mind, but to someone obsessed with Jurassic Park, the T-rex attack on the tour vehicles trumps them all. That obsession will almost certainly leave you wondering if spending $2,500 on a two-piece, 1/10th-scale diorama of that scene is worth missing rent next month, but the answer is obviously yes. You can save a few bucks by opting for either the T-rex side of the display, or the Ian Malcolm and Alan Grant side, available for $1,300 each, but that’s like having to choose between your children. Some of the best things about Solo: A Star Wars Story were its new female characters, especially Lando’s robo-revolutionary droid co-pilot L3 and the mysterious marauder Enfys Nest. Now, they’re both getting the fancy 6" scale treatment. L3's figure will be a normal release in the Black Series line, but Enfys will be joining the series as part of the deluxe range of Black Series vehicle sets, because she comes with her absolutely gigantic swoop bike from the movie to boot. L3 and Enfys will be available this summer for $20 and $60, respectively. There are countless ways to play Monopoly. You don’t always have to follow the official gameplay instructions. But the one rule that every player secretly follows, however (even if they deny it) is that cheating is just fine if you don’t get caught. With that in mind, Hasbro’s new Monopoly: Cheater’s Edition, which is finally available today for $20, actually encourages and rewards your underhanded tactics—if you don’t get caught. There’s extra punishment for players found being naughty (like stealing from the bank or not paying rent), so it’s best to be sly about bending the rules. How often have you misplaced your wallet or keys and wished you had X-ray vision to help search your home for them? With Animi Causa’s Heroshelf, this generic superhero can keep an eye on all of your important accessories, and help ensure you don’t walk out the door without them. 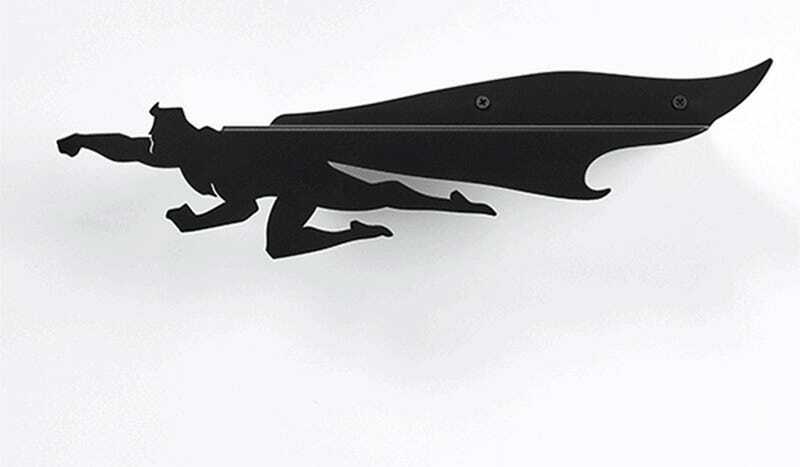 The $50 shelf mounts to the wall with a couple of screws, creating the illusion this hero is soaring through your living room. Functionally, it doesn’t do much more than a regular shelf does, but the eye-catching design will serve as a constant reminder your keys are safe and secure.